While paint is always an option, consider the benefits of wood refinishing. Let’s face it, the easiest way to transform an old piece of furniture is to paint it. But if the piece is well-constructed and made of solid wood, then you might want to consider restoring it to its original condition. 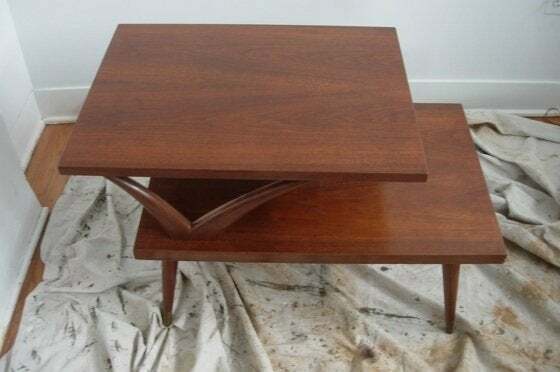 While stripping furniture is messy and requires a bit of muscle and stamina, the results can be amazing (like the refinished table above that was left on the street for trash). Here’s how you can restore your wood furniture. Note: Before you work with a furniture stripper, be sure you read and follow the manufacturer’s directions. They will include safety precautions, application instructions, wait time and clean-up—all important considerations when working with a chemical solvent. Also, be sure to remove hardware or cover exposed metal with painter’s tape to avoid damage from the stripper. STEP 1: Applying the stripper. Use a paint brush to apply an even coat to the wood surface. Let the stripper do its work—generally 15 to 20 minutes for the solvent to loosen the finish. Don’t rush the project and don’t ignore the clock. If the stripper gets too dry, it will be harder to remove. STEP 2: Removing the finish. After the specified amount of time, use a plastic scraper (putty knife) to begin removing the finish. A plastic tool is recommended; a metal one could potentially scratch the wood surface. Try to remove as much of the finish as you can, but don’t fight it. 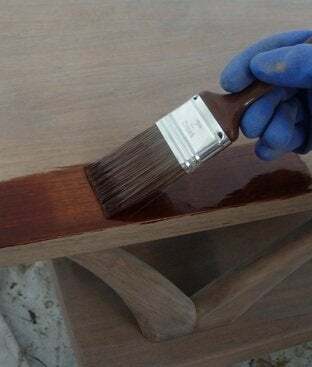 If some of the finish is more resistant, or you are removing multiple coats of paint or varnish, simply repeat the process until the entire finish is removed. STEP 3: Sanding the grain. Once you have the finish removed, dab a pad of fine steel wool—Grade #000—in the stripper and rub the wood in the direction of the grain. This will remove any residual finish. Next, use a fine-grade sandpaper and lightly sand the surface in the direction of the grain. This will help even out any surface discolorations or irregularities. The key to applying stain is that you want to apply an even coat and, depending on how dark you want the piece, remove any excess in a timely fashion. Since the wood has been stripped and sanded, it will be receptive to absorbing the stain, so you should consider wiping off the excess sooner rather than later. After you brush the stain on, use a piece of cheese cloth to remove the excess. If you prefer a darker finish, repeat the process again. Once the piece has been completely stained, its time to protect the wood with either a polyurethane, wax, or tung oil. Although polyurethane is a popular modern-day finish for almost everything, there is something wonderful about a paste wax finish. The wax will add a warmth to the finish and protect the wood from most water damage, especially if it is recoated on a regular basis.